JUST A LITTLE DIFFERENT! THESE SPAGHETTI ANIMALS ARE VASES -- NOT FIGURINES. 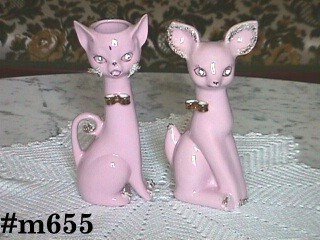 ONE IS A CAT, MEASURES 7 3/4" TALL. SHE IS PINK WITH SPAGHETTI WHISKERS, SPAGHETTI ON ALL FOUR FEET AND SPAGHETTI ON END OF HER TAIL! SHE HAS AN ATTACHED CERAMIC/CHINA BOW THAT IS GOLD COLOR AND SHE HAS CLEAR RHINESTONE EYES. I BELIEVE THE OTHER VASE IS A DEER. ALSO PINK, MEASURES 7 1/2" TALL. HAS THE CRUSHED CERAMIC TYPE TRIM WITH GOLD ACCENTS AROUND EDGES OF EARS, ON FEET, AND TIP OF TAIL. ALSO HAS A GOLD BOW AND CLEAR RHINESTONE EYES. THE FACIAL DETAIL ON BOTH VASES IS OUTSTANDING AND NEITHER HAVE ANY CHIPS, CRACKS, OR CRAZING. THEY'RE BEAUTIFUL! BOTH HAVE ORIGINAL LABELS: LEFTON'S EXCLUSIVES, JAPAN. IN ADDITION, THE CAT HAS A COPYRIGHT MARK FOLLOWED BY SCRIPT: GEO. Z. LEFTON. THESE ARE GREAT ITEMS!